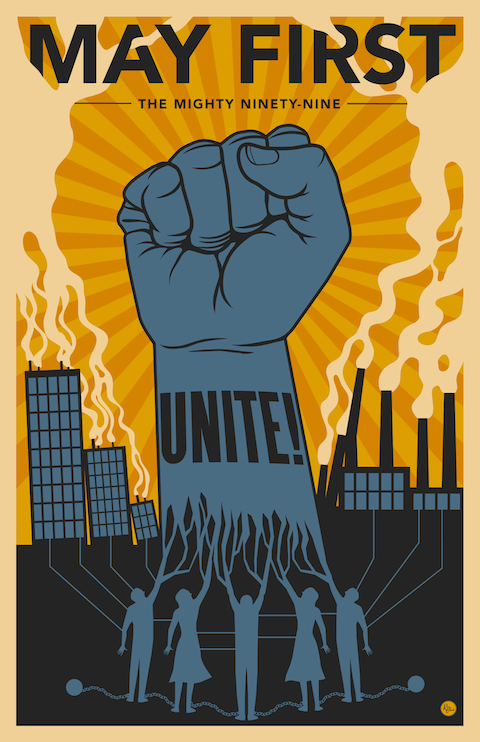 MAY DAY 2012 is part of an ongoing process of “the 99%” reclaiming the heritage of this International Workers’ Day. On May 1, 2006 and again in 2007, immigrant communities and allies boldly took to the streets against government and police harassment. Now, the Occupy movement is seizing the opportunity of May 1 as a next step to reclaiming the legacy of this day. In the past year we have witnessed the emergence of nationwide mass movement of a kind not seen in the United States for many years. In most of the world, for 125 years May 1 has represented a celebration of the struggles of labor and social movements. Yet in the United States where May Day began, this day is largely unknown to most working people, especially those outside of traditional organized labor, its historic meaning steadily buried under the debris of a forty year one-sided ruling class assault on U.S. workers, which has weakened our organizations and with them our institutional class memory. Today, as we enter what looks to be a prolonged period of austerity and even more vigorous attacks on what remains of labor’s past victories, we are experiencing an awakening and renewal of struggle. From New York City to Oakland, California and many communities in between, Occupy is linking to a variety of unions, immigrants and students and taking the messages of struggle to the streets. In order to divert the energy and passion associated with May 1, President Grover Cleveland rejected calls to designate the day a national holiday to honor the labor of the nation’s workers. His administration struck a deal with the more accommodating sections of the labor bureaucracy to de-policitize this “International Workers Day” by moving it to the first Monday of September, now known as Labor Day. The erosion of U.S. organized labor further contributed to this historical amnesia. As the union movement finds itself assailed under ever intensifying attacks, its influence on working class culture has waned. Many labor activists, nonetheless, over many decades have persistently agitated to re-assert the meaning of May Day and reclaim its legacy as a day of solidarity with workers across the world. On May 1, 2006, when millions of immigrants took to the streets, defying the threat of repression and deportation, to assert their rights as human beings, it amounted to a de facto near-general strike of Latino workers in some cities. This was an inspiring beginning of the reclamation of May Day as our day — and now, that struggle is taking on the character of a more general social fightback. During this past year we have seen a stunning level of resistance that few of us could have imagined. The Wisconsin protests against a reactionary governor and legislature’s drive efforts to turn back the clock on workers’ rights set the stage for the Occupy movement. But the achievements of this momentous year are not confined to U.S. borders. The Arab Spring has also had a profound impact on the largely young activists of Occupy, and has imbued them with a will to fight and to believe, against all odds, that we can not only fight, but win. In Europe, militant resistance is spreading against savage austerity imposed by banksters on one country after another. It’s time for the left to shake off the fatigue produced by years of defeat. Whether Occupy groups’ calls for May 1 actions across the country are framed as demonstrations, solidarity or “general strikes,” Solidarity encourages everyone to participate and help build these actions. Although calling for full-scale general strikes at this time is out of step with the practical capacities of our movement, the willingness of young people to fight and to reclaim May Day as our day is a step forward. And many more massive battles lie ahead. May 3—Pickets locked out for more than two months at Chicago’s McCormick Reaper Plant heckled scabs during a shift change and were attacked by police, who used both guns and clubs. Six workers were killed. Later that evening a group of workers proposed a protest meeting for the following evening in Haymarket Square. May 4—Mayor Carter Harrison issued a permit for the rally, which began in Haymarket Square at 8:30 with a crowd of 2,500. The mayor attended most of the event, and then walked over to the nearby police station to tell the officers to send the men home since meeting was almost over. When Harrison left, plainclothesmen reported that fact to Captain Bonfield, well-known for his anti-immigrant, anti-labor views. He then ordered 176 policemen to march in a military formation developed for crowd control—marching in columns from sidewalk to sidewalk–and disperse the meeting. The police attacked at 10:25; only about 200 people were still present. Suddenly a bomb was thrown. Whether the bomb thrower was a police agent or a worker has never been established, but four workingmen and seven policemen were killed; many more were wounded. May 5—Inspector Bonfield and Captain Schaack declared martial law, closed down the union newspapers and outlawed the right of assembly. Hundreds were arrested, 31 indicted yet only eight were tried for conspiracy. Only two had been present when the bomb was thrown. The Haymarket Eight—George Engel, Samuel Fielden, Adolph Fischer, Louis Lingg, Oscar Neebe, Albert Parson, Michael Schwab and August Spies–were a cross section of that era’s labor movement. All but Parsons were immigrants. August 20—The jury, which had been handpicked, reported its guilty verdict. Seven received the death penalty and one, Oscar Neebe, was condemned to 15 years of hard labor. 1887—After the appeal to the Illinois Supreme Court was upheld and the one to the U.S. Supreme Court denied Parsons, Spies, Fischer and Engel were executed on November 11. The previous day Louis Lingg killed himself in his cell. Thousands of workers marched in the funeral procession; nearly half a million people stood and watched along the route. 1889—The Second International adopted May Day as an international workers day in honor of the “Martyrs of Chicago.” The workers movement has celebrated the day ever since. It is easy to understand why immigrant workers, for whom May Day is a tradition, would revive May Day in 2006, when they demonstrated opposition to the anti-immigrant Sensenbrenner bill. 1892—Governor John Peter Altgeld pardoned Neebe, Fielden and Schwab. This was the result of the tireless work of Lucy Parsons, who began a cross-country tour to tell the story of the Haymarket events as soon as the eight were pronounced guilty. She went to Europe to secure support, where George Bernard Shaw, Oscar Wilde and Prince Peter Kropotkin circulated petitions and led mass marches to protest their execution. William J. Adelman, Haymarket Revisited, A Tour Guide of Labor History Sites and Ethnic Neighborhoods Connected with the Haymarket Affair, Chicago: Illinois Labor History Society, 3rd edition 2004. Carolyn Ashbaugh, Lucy Parsons, American Revolutionary, Chicago: Charles H. Kerr, 1976. Henry David, The History of the Haymarket Affair, NY: Farrar & Rinehart, revised 1958. Lucy Parsons, The Life of Albert R. Parsons, a rare book originally written in 1889 but many later editions. David Roediger and Rosemont Franklin, Haymarket Scrapbook, Chicago: Charles H. Kerr, 1986. Timeline of MayDay is impressive. Great work ! La France, leader du forex ? On peut aisément se poser la question quant à la France, qui est l’un des pays aux marchés boursiers les plus mouvementés. Venez ainsi vous intéresser au forex en ligne (voir) sur un site spécialisé : graphiques sur le forex, tendances des marchés et autres informations sur la bourse vous seront fournies. Vive la France !